Almost exactly ten years later, the comic’s elusive creator, Bill Watterson, abruptly called it quits, despite the comic’s extreme popularity. So how did it come together? Why did it last only a decade? And what has Watterson been up to in the over two decades since he retired at the young age of just 38? For much of high school and college, Watterson thought he was going to be an editorial cartoonist and went to Kenyon College in Ohio to pursue that. As so often happens when anyone is first starting out at anything, the first few cartoons he produced were failures. There was Spaceman Spiff, a brash, stogie-smoking astronaut with incredible interstellar adventures and always foiled by his dense assistant Fargle. There was another one about a newspaper reporter and his crazy editor. Another one that featured a frog and a groundhog and one called Critters about small bug-like creatures. Then, in 1983, he created In The Dog House, a strip featuring a 20-something Sam and his slacker friend Fester, plus Sam’s little brother Marvin, who happened to have a stuffed tiger whom he called Hobbes. In The Dog House didn’t get any love, but Melvin and Hobbes did and he decided to give them a comic of their own. Calvin is named for a sixteenth-century theologian who believed in predestination. Most people assume that Calvin is based on a son of mine, or based on detailed memories of my own childhood. In fact, I don’t have children, and I was a fairly quiet, obedient kid — almost Calvin’s opposite. One of the reasons that Calvin’s character is fun to write is that I often don’t agree with him. Ultimately Universal Press Syndicate picked up the comic and, on November 18, 1985, Calvin and Hobbes made its debut. Calvin is autobiographical in the sense that he thinks about the same issues that I do, but in this, Calvin reflects my adulthood more than my childhood. Many of Calvin’s struggles are metaphors for my own. I suspect that most of us get old without growing up, and that inside every adult (sometimes not very far inside) is a bratty kid who wants everything his own way. I use Calvin as an outlet for my immaturity, as a way to keep myself curious about the natural world, as a way to ridicule my own obsessions, and as a way to comment on human nature. I wouldn’t want Calvin in my house, but on paper, he helps me sort through my life and understand it. In terms of the overriding question of the comic strip – if Hobbes is real or not – the author again attempts to clear it up, but not in the way that most would think. The so-called “gimmick” of my strip — the two versions of Hobbes — is sometimes misunderstood. I don’t think of Hobbes as a doll that miraculously comes to life when Calvin’s around. Neither do I think of Hobbes as the product of Calvin’s imagination. Calvin sees Hobbes one way, and everyone else sees Hobbes another way. I show two versions of reality, and each makes complete sense to the participant who sees it. I think that’s how life works. None of us sees the world exactly the same way, and I just draw that literally in the strip. Hobbes is more about the subjective nature of reality than about dolls coming to life. By 1995, Calvin and Hobbes was one of the most popular comics in the world, syndicated in over 2,400 newspapers worldwide with more than 24 million copies of the 14 book collections having been sold. That’s when Watterson decided to call it quits. Beyond painting, he also for a time would secretly autograph copies of his books at Fireside Bookshop in Ohio, but ceased the practice when he found that people were just buying said copies and then selling them online for high amounts. Beyond this little pastime, he has occasionally published or contributed to books examining Calvin and Hobbes, such as the excellent book, Exploring Calvin and Hobbes – An Exhibition Catalogue. But other than that and a little charity work here and there, as far as public record goes, he’s seemingly just enjoying a quiet retirement and actively staying out of the public sphere. It’s always better to leave the party early. If I had rolled along with the strip’s popularity and repeated myself for another five, 10 or 20 years, the people now “grieving” for “Calvin and Hobbes” would be wishing me dead and cursing newspapers for running tedious, ancient strips like mine instead of acquiring fresher, livelier talent. And I’d be agreeing with them. I think some of the reason “Calvin and Hobbes” still finds an audience today is because I chose not to run the wheels off it. I’ve never regretted stopping when I did. What Happened to Actor Rick Moranis? What Ever Happened to Miss Cleo the TV Psychic? You left out his legendary “guest artist” appearance in Pearls Before Swine the first week of June, 2014. Well, heck, if Berkeley Breathed can make a comeback with Bloom County, why not Watterson? What a great time for nostalgia if he gave it a go. This comic is one of the typical examples of procrastination: Calvin and Hobbes: Procrastination Why stopping procrastination is difficult Human beings have limited self-control. To this day, I have seen neither fresher nor livelier talent than Watterson’s. I still regularly check out C&H from the library, and my son has adored them since he was three. I loved his work. Still have 2 T shirts that are now yellow as I’m afraid to beach for fear of fading “Calvin “ in one of his moments. I only wear it when I feel exactly that way. I love how he worked in Spaceman Spiff into Calvin and Hobbes, I never knew it was a former project for him. Bill Watterson’s “Calvin & Hobbes” was a thing of Sanity for me. It was 1990, I was in the Marine Corps Infantry on my way to the Gulf. I had been given enough time to grab a few things from the Post Exchange at an Air Force Base. I saw a “Calvin and Hobbes” Book. I grabbed it on my way to the check out. I read it so many times that the book fell apart and I lost every page eventually to the weather and moving around while over there. I will never forget the Happiness and laughter it would bring me when I was there with the unexpected. It was like having a friend with me that I grew up with. I have a small stuffed Tiger that my wife gave me from the World Wildlife Organization, his name is Hobbes. I Gave her an Elephant from the WWF and she named him Calvin. My son has his own stuffed Tiger named Hobbes. And as a child, yes, I actually had a big stuffed Tiger. He had no name but I slept with him next to me or standing guard over me. I always thought Hobbes was named after John Hobbes the English Philosopher. Especially with all of the philosophical conversations Calvin and Hobbes had. If Mr. Watterson happens upon this, Thank You from the Bottom of My Heart. P.S. Those individuals who got your autograph in one of the books that sold them, They are fools and Karma is very fickle. I would have treasured such a Book and passed it on to my Children to keep in the family and learn from. 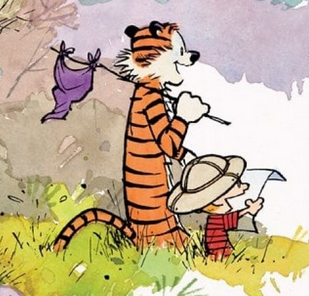 I really appreciated the look of Calvin & Hobbes. It was like Wally Wood had drawn it. Of course it is good Watterson did not go the way of Wood (angry alcoholic pornographer). It was admirable he went out on top. We can always relish Watterson’s work in collected albums. It was unfortunate that Schulz (Peanuts) hung around too long. When your punchline for weeks on end is chocolate chip cookies, it is sad. It is also sad that the syndicate is still running his stuff and depriving new talent space to express themselves. The imaginary friend was a fine vehicle, but the writing of C&H was what put the comic on another plane.